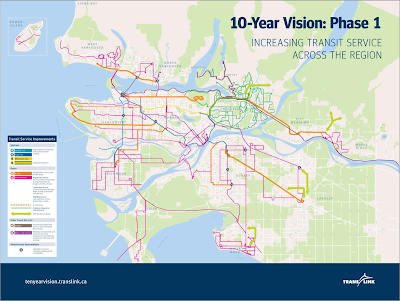 Map of improvements proposed in TransLink's 10-Year Vision. 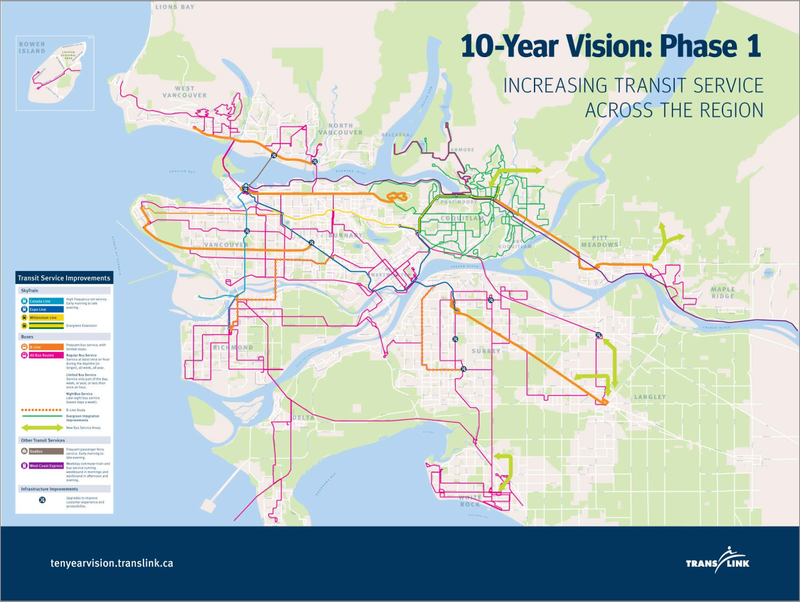 Last month, TransLink engaged in a public consultation process to see what people thought about the agency's proposed 10-Year Vision for the region. I’ve posted a few times about what this would mean for the South of Fraser and the rest of the region if approved. TransLink recently released the results of the public consultation which saw 5,000 questionnaires completed and 300 people attend public open houses throughout the region. So, what did people have to say about the plan? It should come as no surprise, but there is broad regional support for expanded transit service throughout Metro Vancouver. Only about 4% of the comments received expressed concern with some, or opposition to all, of phase one of the plan. In fact, many people said that the plan didn’t go far enough. Given that this is only phase one of a three phase plan, more transit investment is coming when the funding becomes available. During the failed transportation plebiscite much was said about TransLink waste, but that turned out to be a red herring. In fact to pay for phase one of the 10-Year Vision, TransLink is using $100 million from the sale of property; selling assets. It is very positive to see that around 70% of the comments received were generally supportive of plan's funding mix. I believe that people understand that if you want to expand service, taxation revenue is required. People in our region really want to see transit service expanded. On November 23rd, this plan will be brought forward to the TransLink Board and Mayors’ Council at a joint meeting for potential approval.